Steady state cardio training, such as running at the same pace for what seems to be endless miles at a time, can get boring. And when your workouts are dull, you're at risk of losing motivation to stick with your training routine. It's important to change things up and challenge yourself to run or swim at higher intensities as well as time your results. 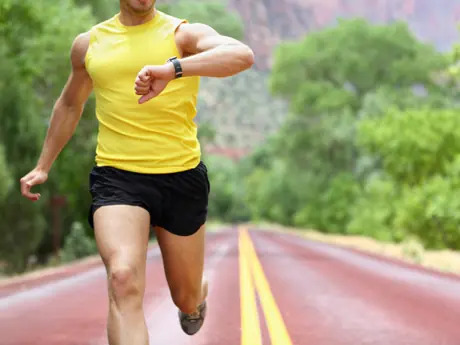 This is called interval training and it helps to make whatever race you may be training for more exciting and help you get faster in a shorter amount of time. Most people don't have the time to train for hours a day. Interval training allows you to train for fewer hours and still improve your performance. Interval training not only burns more calories (and who doesn't want to do that), it increases your aerobic capacity as well. Runners typically use interval training. However, it also can be an effective way to increase time in a triathlon or duathlon. Grab your timer and head out for a run or ride. Below are two examples of interval training workouts you can use. The first is for runners in higher altitude hilly terrain. The second provides a guideline of how to use intervals for biking or running. Warm up for 5 minutes at a perceived intensity rate of 2 to 3. Warm up with a walk for 5 minutes at low intensity of 40 to 50 percent of heart rate max. Run/bike hills for five minutes at high intensity of 80 to 95 percent HR max. Complete three five-minute sets. In between sets, recover for 3 minutes either walking or slow biking. Cool down walk/bike for 10 minutes at low intensity of 40 to 50 percent HR max.